How Does the Otometrics MADSEN Astera2 Support Tinnitus Management? How does the Otometrics MADSEN Astera2 support tinnitus assessment and management? Clement Sanchez: The MADSEN Astera2 from Otometrics is the only clinical audiometer with a dedicated tinnitus evaluation module. It has the psychoacoustical tests that we discussed, along with the tinnitus questionnaires, built in. And, the tinnitus evaluation module is very well integrated into the professional’s workflow. It guides you through the evaluation process. The MADSEN Astera2 includes additional functionality including loudness scaling so that you can measure sound sensitivity for patients who also demonstrate that symptom. It also enables you to conduct Bekesy audiometry, which is not something new and fancy, but can be very useful for a tinnitus evaluation. For example, it is useful for patients who report that their tinnitus changes throughout the day – maybe sometimes it sounds like a low frequency buzz while other times it is a high frequency sound. With Bekesy audiometry, which is automatic, you can quickly and easily determine the pitch of their tinnitus and also get information on the patient’s sensitivity to sounds. MADSEN Astera2 provides all these fundamental tools in an integrated and clear workflow for a complete tinnitus evaluation that is aligned with best practices. Wendy Switalski: The clear layout of the MADSEN Astera2 tinnitus evaluation module makes the evaluation process very easy for professionals. For people that are new to tinnitus, it is a very approachable way to add tinnitus assessment to their practice. And, not only is the tinnitus module integrated into the Astera2, but the Astera works with the OTOsuite software. That means it is very easy to compare tinnitus assessment results and questionnaire results over time. There is one other very important piece to tinnitus assessment - reimbursement. There is a CPT code for psychoacoustic evaluation, and the workflow in the tinnitus module ensures you have completed the necessary steps for documentation and reimbursement purposes. Lastly, it generates a tinnitus report for referral sources. For more information and to access reference materials and available training, please visit www.audiologysystems.com/tinnitus or call (855) 283-7978. You are also invited to join the conversation and follow Audiology Systems on Facebook, Twitter and LinkedIn, and view the Otometrics / Audiology Systems Expo Page on AudiologyOnline. Clément Sanchez, Au.D M.Sc. 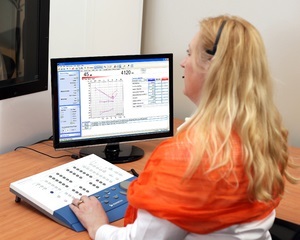 is a product manager and audiologist for hearing assessment at GN Otometrics. Throughout his education and career, Mr. Sanchez has had special focus on tinnitus and tinnitus assessment. Prior to joining Otometrics, Mr. Sanchez was a practicing audiologist and the product specialist for companies such as the Temporal Bone Foundation in Brussels, Belgium, a hearing aid dispensing chain in France, and GN ReSound. He holds a specialized degree in newborn audiology from the Medicine School of Bordeaux and a Master’s degree in audiology from the Pharmacy School of Lyon.